There is no greater tradition at Purdue than its history. There are no Boilermaker values larger than those of inclusion, academic excellence, and blazing the new frontier. Purdue put a person on the moon, flew a woman around the world, created Nobel Prize winners, and now it is time for LGBTQ students to enjoy the rich tradition of Purdue University. Purdue was founded in 1869 as a land-grant institution. Purdue was founded for the common person, a place for people to learn and discover regardless of where they came from. We are both from Frankfort, Indiana. Purdue meant something to us as we grew up, and we are direct products of that experience. We came for the Bug Bowl, Space Days, theatrical performances, and summer research. We were inspired by what Purdue was doing –in the community and on the court. Our intellectual development was most influenced by a Purdue graduate who took an interactive approach to teaching. These are the experiences that gave us the drive to become Boilermakers. As former presidents of Purdue’s Queer Student Union, we have seen gradual progress. We feel safer on campus now than when we first came. We have come to see people that care, and systems in place to protect students regardless of sexual orientation or gender identity. From the Chicago Botanic Garden to Capitol Hill, faculty members have demanded academic excellence from us and taken interest in who we are as people and students. As student leaders on campus, we have been involved in updating the nondiscrimination policy, making bias reporting procedures more accessible, supporting the creation of an LGBTQIA film festival, advocated for a minor examining LGBTQ issues, and the hiring of a Director of LGBTQ Affairs. We have embraced the Purdue tradition of expanding opportunities for others. Every day we take a step closer to inclusion for everyone – whether it is by coming out, attending an event, or by advocating for our fellow students. The Purdue community is striving towards the acceptance of all people. We have grown here. Purdue is our home and our alma mater. We are Boilermakers. 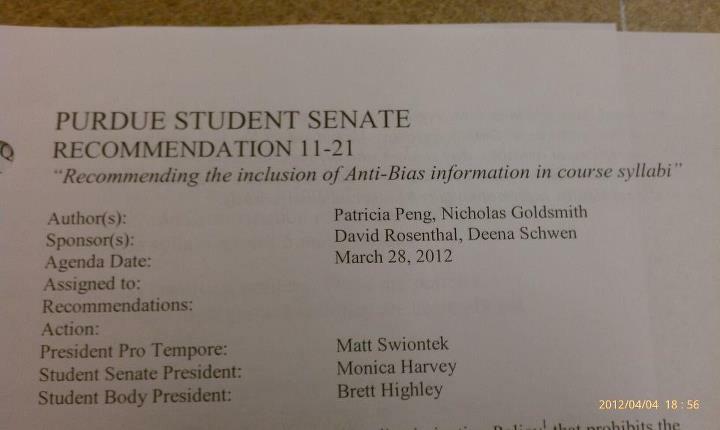 "Recommending the inclusion of Anti-Bias information in course syllabi"
Tonight I went to the last Purdue Student Government meeting of Session 11. It was a really fun meeting to attend. There were a number of bills - some serious, some recognition, and some humorous. I just want to briefly touch on two. The first was my bill. 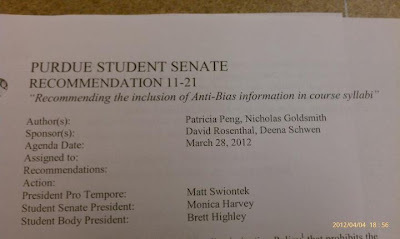 Senator Rosenthal and I had talked a bit about trying to get bias reporting information (including the URL to the online bias reporting form) added to course syllabi. I think this is an important information for this kind of information to be. I don't think students know much about this policy, and I think many students don't think about these kinds of policies until they may need them. Thus having the bias reporting information in syllabi will increase the likelihood that a student has seen that information and can readily find it. I hope this is a step in getting people to start reporting incidents of bias. Without these incidents being reported, it is hard for campus to respond. I also think this shows Purdue's has some commitment to trying to work to be inclusive. I also feel that wider knowledge about these policies will make some students feel more comfortable. Students may realize a category they identify with is included, or just feel safer knowing there is a way to report if something does happen. I am overjoyed to be able to say that Purdue Student Senate unanimously approved this resolution. The second bill I want to address briefly was the "Senator of the Year" resolution. This bill honored Senator David Rosenthal. I am happy that PSG chose to recognize him. It has been great working with him over the past year, and he has been involved in a number of resolutions that is and will help Purdue students. I have a lot of respect for Purdue Student Government. I have been highly impressed, and during the past two years I feel that PSG has been exactly what a student government should be. They have room to grow, but I think they have blazed a fantastic trail. I am glad I have gotten to work with PSG through CORE, directly and indirectly on legislation, and through friendships. Today I opened the Purdue Exponent to find an opinion letter entitled, "Resident provides suggestion for LGBT youth." I have talked to some people about a positive and more expansive way to respond, but I feel like some people are going to visit here looking for something to be said. I thus want to take a moment to respond to this, but not enough to really go into all of the details. A lot is moving forward right now for Purdue, and it is better for me to be a part of that then to respond to this letter. I will thus take a quick moment to talk about the letter so as not to let people down, and then go back to better things (including a much better way to respond to this letter too). I'm also going to respond by sections. Remember, this is not an expansive response, just a quick one as I know people will be asking me. Many of us are getting a bit tired of hearing about the demands of Purdue’s so-called gay and lesbian community. I'm a bit flattered with this first sentence to be honest. You are actually hearing our demands? I'm surprised because I often feel like I have a hard time seeing it. If you don't like hearing about it though, I don't think it is very hard to ignore. Also, I don't know how to feel about the "so-called gay and lesbian community" statement. Is that so-called because you don't think there is actual natural variation in sexual orientation? Is that so-called because you think it is small? Is that so-called because you think it isn't very cohesive? If I knew which one I might be better able to respond to the so-called statement. Also, just quickly on only mentioning Gay and Lesbian, at least when I was president of the Queer Student Union (now LGBTQ Student Alliance) I spent more time on Trans issues than I did on Gay and Lesbian issues. There are a lot of identities in LGBTQ (more than just 5! ), and they aren't just Gay and Lesbian. I suspect that many of those most vocal are probably out-of-state students. Sorry if I'm not being very humble here, but I think you could put me pretty high on the list of "most vocal" students for LGBTQ issues. I'm not only an in-state student, but I grew up in Frankfort, Indiana, and attended school from preschool through high school in the Frankfort School Corporation. The president of the QSU that followed me was also from Frankfort, Indiana. Vocal Queer students are not imported from other states, they can be found in Indiana. Not only found in Indiana, but found in cities and towns pretty close to West Lafayette. I have to ask why did they apply to Purdue in the first place, if all they are going to do is complain about it? I applied to Purdue because it is an academically strong school and does a lot for the surrounding community. Growing up I had the opportunity to attend many events at Purdue, I got to participate in research at Purdue while in high school. I actually like Purdue a lot. I criticize Purdue because I want it to be all it can be. I think Purdue has a lot of potential, and I want it to live up to its full potential. I want students to want to go to Purdue, to want to stay at Purdue, and to really enjoy their Purdue experience. I don't complain because I hate Purdue. If I hated it, I would have transferred. These petulant children have ‘gay friendly’ schools in their home states, and the Hoosier troublemakers (if any) should have applied to Bloomington. Purdue and IU are the two major universities in my current home state - Indiana. I could have chosen either, but I discussed earlier a brief reason why I choose Purdue. Next year I will be leaving Purdue to attend a "gay friendly" school in another state - Minnesota. I am doing this for graduate school. People typically go to another school for graduate school. If I may be frank too, I am also a bit ready to leave Indiana. I did take Queer friendliness into account when considering which schools to apply to (both schools I applied to - Minnesota and Toronto - I feel seem Queer friendly). I don't think that is the only reason why one should choose a school though. We students need to go where we can get the best education for us. For me that has been Purdue for my Bachelor's, and will be Minnesota for my Ph.D.
As a Christian, I hate the sin, but love the sinner. Purdue is a public school, that is irrelevant. Besides, being Christian says nothing about one's feelings on being LGBTQ or even if LGBTQ identity is a "sin." I see no reason to destroy these people, but they should not be working to destroy our Boilermaker values either. so these young people can be directed to better pursue their values and ‘interests’ unhindered in more accepting institutions, and traditional Boilermakers who love Purdue and are happy with it as it is can better pursue our own values and interests as well. I discussed a bit before what I feel are Boilermaker values. I have a question though - do you really think Purdue is all it can be? As I said before, I like Purdue. I like it a lot. I am glad I am a Boilermaker, and will be graduating in May from Purdue. Yet I don't want to limit Purdue to what it is now. I think it has the potential to be even greater of an institution. Do you really want us to stop asking Purdue to improve? It isn't just LGBTQ issues that many of us are asking to be updated. I will restrain myself a bit and only give one example. Okay, maybe two... If you want an example of how the Queer community loves Purdue, look at homecoming. The Queer Student Union for the past two years has been a part of the homecoming celebrations. If you want an example of how the Queer community is working on issues that improve Purdue for more than just LGBTQ students (we won't touch the idea that helping LGBTQ students also helps all other students in this blog post), one thing that the LGBTQ community had requested of Purdue was the creation and advertisement of an online bias reporting form. This helps enable all Boilermakers to report issues of discrimination and harassment in a much easier way than before. Did we not help to improve Purdue that way? Does that not help those "traditional Boilermakers"? I want Purdue to live up to its founding as a land grant university. I feel that Purdue has potential to be an even greater institution, and that we can help to get it there. Okay, that is just a quick response from me for those who might want it.